We just published our research testing whether a new dynamic physician note design would be better (faster to read, able to find correct information more often) than today's typical EHR note. The new designs had advantages. Four model notes were compared. A is the traditional SOAP note. B, C, and D move Assessment & Plan to the top. The second column demotes some content's visual importance. The easiest change to make (B, C, and D above) is putting "Assessment and Plan" at the top of the note. That's where readers go the vast majority of the time. Other parts of the note are used less often, and then mostly to find a specific detail. Making this change is technically easy. Readers understand it. It makes writing a note no more difficult than it is now. A second improvement is also fairly easy to make (B and D), and has been implemented in a number of EHR platforms already. I posted about this years ago (A Beautiful EMR Note!) when I first saw such a note from eClinical Works. This moves the "lists and the past" to one side in a smaller subsidiary column. The main story (Present Illness, Exam, and Assessment and Plan) all stay in the wider main column. The reader finds relevant details faster because the more stable background details are swept to the side. This reduces visual clutter and information overload. What if readers could find the sought-after details more easily by removing visual distractions? Physicians know that some parts of the notes are lists, mostly normal, but with scattered abnormal details which happen to matter most. If those lists would highlight the details that matter (the abnormals, such as "cough, fever, nausea" in the Review of Systems, or "redness, tenderness, swelling" in the Physical Exam) and visually subdue or hide the boring normal list items, then readers could see more by showing less. Figure 2. The header can collapse and still reveal the important abnormal details. Figure 3. Collapsed, showing only the header. We used a couple of approaches. One was to make the abnormal terms bold and color, but leave the terms among the list text. The other was to extract the abnormal text and just display it in the header for that section (e.g. the Physical Exam), along with a "count" of abnormal items. The challenge to implementing this is identifying the words that are abnormal. I think we are on the cusp of a new era when documenting the lists (used to count bullet points for fee-for-service billing) will be less necessary to prove our work as physicians. Instead, we can refocus on the patient's story, our clinical reasoning, and the plan of care, while letting the health record database carry the burden of collecting and displaying information in a meaningful way that reduces the cognitive workload of the physician. Data visualizations, dashboards, and focused reports can carry the weight that until now has been shouldered by physician notes. It's time for a change. As patients (aka "consumers of healthcare"), we should be paying for outcomes instead of bullets. I went to see my family physician for my annual visit. He mentioned that the chronic disease registry listed me as having hypertension and diabetes. That's not so, and my family physician recognized the registry assignment errors immediately. I know where each of those mistakes arose. On one occasion 2 years ago, I had minimal elevation of my blood pressure, and many subsequent normal blood pressures. And in 2013, I attended an employee health screening (fingestick specimens) where I had a barely elevated fasting blood sugar of 108, with a normal upper limit of 100. The actual diagnostic criteria for diabetes are either a blood sugar 126 mg/dL or higher, or an A1C level 6.5 percent or higher on two separate occasions. I certainly don't qualify for the diagnosis of diabetes by either criteria. There must be a rule in my doctor's population health registry model that says "single abnormal value = disease", even though that is almost never the rule from the physician perspective. For my healthcare organization to really manage population health, all the parties will need to trust the data and its analysis, and both must be trustworthy. The most convenient data (a single measure, misapplied in my case) may not be meaningful or trustworthy. The analysis can't just be trustworthy 70% of the time. Understanding a population health registry takes hard work and clinical insight. When the data comes from multiple sources, such as billing diagnoses, clinical records, and from payment sources, there are many opportunities for error. Your team needs to understand the source of every data element. How do we balance thoroughness and conciseness when displaying lab results? Some clinicians prefer viewing the selected results most likely to be actionable. Some prefer to see all results all the time. Are there approaches that meet both needs? Let’s try to display all abnormal results concisely while revealing that other results are in the normal range without necessarily showing the numbers in a tabular field. We can represent all elements of a CMP (comprehensive metabolic panel) in a bar graph called a win-loss graph. Upward bars for win-loss graphs in a sports setting typically represent a win, while downward bars represent a loss. In our clinical setting, we let upward bars represent abnormal high values while downward bars abnormal low values. Critical values can be rendered with more intense color or longer bars, or both. Here’s a win-loss graph for a normal BMP result. The individual test names are shown. The vertical dividers separate the functional elements of the graph sections: electrolytes | renal function | other. Here are win-loss graphs for a CMP with and without the labels for individual test names. The functional elements can be described as: electrolytes | renal function | other | proteins | liver function. Patterns often reveal clues to disease. Here, the graphical patterns reveal abnormality without displaying discrete numeric results. This is of most benefit when the results are normal, the trends of change are not significant, and the numeric details are readily available with low effort. The win-loss graph does not display time trends well, but does give a “sparkline” (word-sized graphic) snapshot of a lab panel at a single point in time. There will be some learning involved to recall the location of each individual test, but the vertical separators make that easier. Alternatively, displaying the lab test names takes up very little additional space. 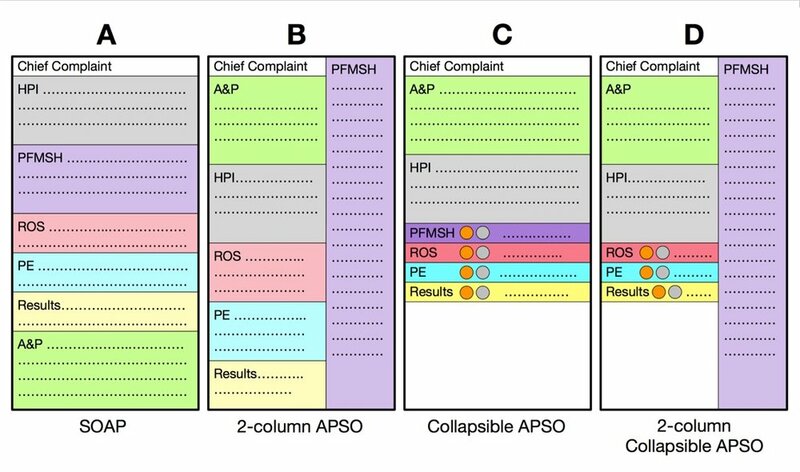 When designing dashboard displays of various clinical parameters for a single encounter (clinic visit or daily hospital visit), the win-loss graph can concisely display that abnormal values in a lab panel (such as BMP, CMP, or CBC) exist, while confirming the normality of all the other individual elements of the lab panel. I just got a report from a neurologist at University of Missouri Health Care. It gave me delight! Why? This study shows evidence of severe carpal tunnel syndrome on the right side with ongoing denervation. There is no evidence of neurogenic thoracic outlet syndrome. Nerve conduction EMG does not rule out vascular thoracic outlet syndrome. What's delightful about carpal tunnel syndrome? Nothing really. Getting a report that clarifies the diagnosis is often a relief for my patient who has been wondering what is causing their weird symptoms that stumped me, the family physician. Knowing it's a treatable problem helps. Knowing what it's NOT is often a relief: "It's not a stroke. It's not cancer." This report was delightful to me as a physician dedicated to clear communication. The diagnosis is clear, and written in plain language with the proper clinical terms (not just lay language). The list of abbreviations shows consideration for the reader. There's a warning about what has NOT been excluded diagnostically: "Nerve conduction EMG does not rule out vascular thoracic outlet syndrome." The whole "Conclusion" is a clear, tight, thoughtful package. It might be no surprise to learn that this physician was also recently awarded the National Golden Apple Award for Teaching Excellence by the American Medical Student Association. PCP workflows were unpredictable during face-to-face patient visits. Workflow emerges as the result of a “dance” between physician and patient as their separate agendas are addressed, a side effect of patient-centered practice. Some workflows can be fairly simple. For instance, e-prescribing refills of a single medication (generic oral contraceptive) for a woman returning for her annual well woman exam. She has the same job, the same insurance plan, the same copay amounts, and the same medication. These details make this particular e-prescribing workflow simple. This can be done with fast, recognition-based, System 1 thinking which takes little cognitive effort. [Kahneman, Thinking, Fast and Slow]. Now by contrast, imagine an older patient with 8 different medications and as many chronic problems. Some of the medications are more expensive, because they're not available generically. Thus there are more opportunities for dug-drug and for drug-disease interactions. There may be opportunities for dual benefits from a new prescription that benefits more than one problem. If the insurance plan has changed since last year, then copays and coverage may be significantly different and thus require the attention of the physician and patient. In some cases, prior authorizations may come into play. This process requires system 2 thinking, deliberative, slow and effortful, and requiring sustained attention. 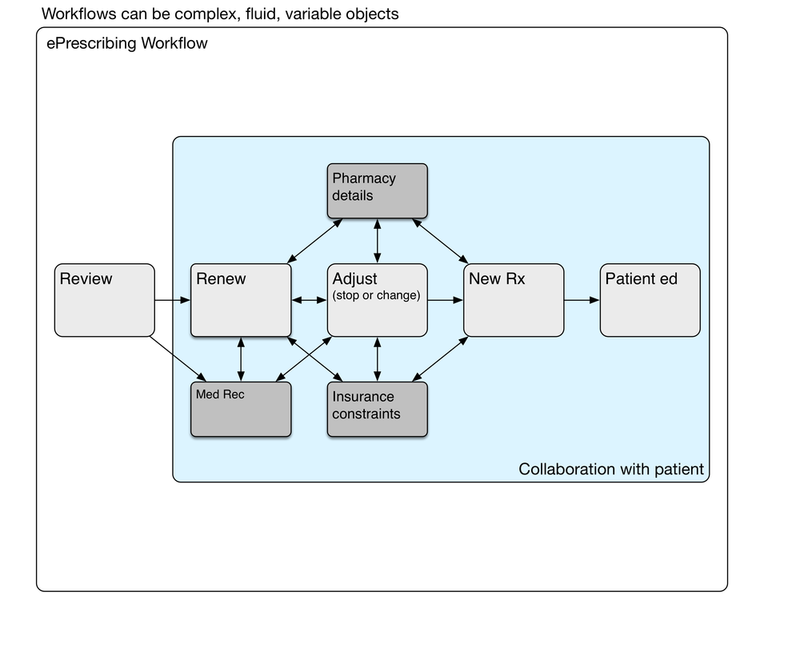 To appreciate the underlying complexity and mental effort, let's take a look at a simple e-prescribing workflow model, and then drill into the details. Here's a diagram showing a simple e-prescribing workflow. The physician reviews the current medications and problems, takeing care of any renewals needed. Some of the medications may need adjustment, such as a change in the number of daily tablets, switching to a new drug strength, or stopping the medication. New medicationss may be prescribed. Finally, the physician and patient have a conversation about what to expect from the new medication. Written materials may be provided by the physician, although pharmacies provide those written materials more commonly. Medication reconciliation may be done at the review stage, during medication renewal, or later adjusting medications. We haven't mentioned medication reconciliation (med rec) yet. It may be a part of some ambulatory encounters, particularly after transitions of care such as hospitalization or emergency department visits where medication lists have been changed. When should med rec be done? Can it be done more than once during the encounter? Does it need to be done for every encounter? Medication reconciliation is a sidetrip in the e-prescribing workflow. The timing of the next appointment determines which meds need to be renewed. The decision to renew a particular medication depends on when the next anticipated visit would occur. Sometimes this is a matter of routine, such as every three or six months for someone with diabetes. That maybe once a year for somebody with high blood pressure. Fairly often, the interval is determined by newly identified clinical needs and negotiation between the patient and physician. Hotter colors (red, orange) depict greater cognitive load. Sometimes it's simple. For an annual visit with no new medications and nothing changed, renewing all the medications may be as simple as a handful of clicks. However, if different prescriptions have different destinations (controlled substance prescriptions must be printed, some go to a mail order pharmacy for a 90 day supply, and others go to a local pharmacy for a 30 day supply), then it can get complicated. System 2 thinking again. Depending on the insurance formulary, some medications may have higher co-pays, and those copays can be unaffordable for many patients. Formulary visual cues at the point of care can lighten the physician's cognitive load somewhat. Nevertheless, it takes deliberate effort to find formulary alternatives that will be less expensive for the patient. The choice of an alternative medication is a collaborative process involving the patient. Some medications (expensive, risky, or commonly overprescribed) require prior authorization by the insurance plan. This is a time-consuming process that will occur after the physician visit has been completed.